There are many photostable sunscreens in the market that provide great PPD protection. I have tried them. But most of them feel heavy and greasy which is too much for my normal/combination skin not to mention it won't stand a chance in New York summer. You can read about PPD in depth here, but basically the PPD number has to be greater than 8, otherwise it won't provide the "beauty protection" that you're looking for, although it may protect you from the UVB rays. These three sunscreens are just okay in terms of the PPD number (around 8) but all have very light consistency and cosmetically elegant. In other words, they won't turn you into a greaseball in the name of protection. This comes in a watery gel formula that is great to use on body in the hot humid weather. Since the blockers are chemical, it does not leave any white cast. Despite of the alcohol content, it still feels hydrating and quite mild. 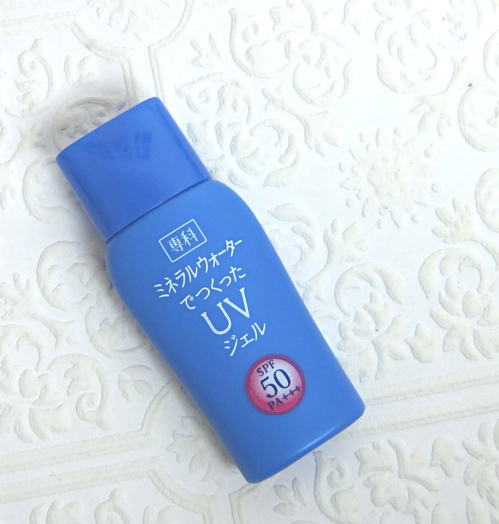 It also comes with higher UVA protection (PA+++) that is quite rare in Japanese sunscreens with lower SPF numbers. It is scented with a very faint fruity fragrance that is barely detectable. The price is affordable as well (under $15 for 3 fl oz.). This is the sunscreen for my neck. I wanted something that provides higher protection (a woman's neck is as important as her face, you know) yet not waterproof. Anyway, Shiseido FT Senka Mineral UV Gel fits the bill. The name is misleading since this is basically a chemical sunscreen with a bit of zinc oxide and it does smell a bit chemical, but it feels more hydrating than the usual waterproof ones that I use on my face. This is one of my favorite sunscreens for face. It doubles as a makeup base and long lasting. I have used many of the pink bottle (reviewed) but tried the white bottle this time. It supposedly has the whitening effect and brightens the complexion by just a little unlike the pink one that has more color to it, yet it provides a very smooth base for foundation. This is a waterproof sunscreen, so you would need good cleansing oil or an equivalent to remove it properly. If you have drier skin, you might be able to use sunscreens with higher PPD numbers without compromising. (here is a list for "legit sunscreens"). For my combination skin, these are quite ideal in terms of protection and affordability despite of the slight compromise in PPD coverage, and I would recommend them if you have similar skin types. I have not experienced any adverse effect from using them, but please be advised that all three contain alcohol and silicones. What is your favorite sunscreen for summer? Do you use different sunscreens for face and body? Great post, Lena - I haven't tried any of these, but the white Biore one sounds especially good, and I've heard good things about Biore sunscreens from another beauty blogging friend as well. I'm currently using a Murad Oil-Free sunscreen, but I hate it; despite the name, it feels heavy and greasy on the skin :/ I want to use it up this season, and I'll be looking into better options for next year! 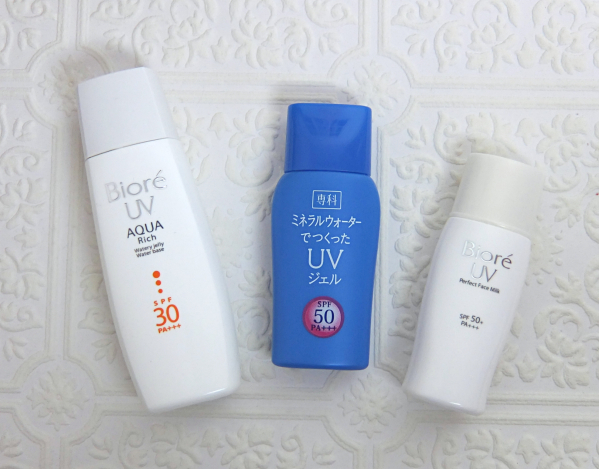 I like Japanese waterproof sunscreens in general, but Biore has to be one of my favorites. The UV perfect series has no scent and performs as well as the higher-end favorite like Sofina. I find many oil-free sunscreens tend to feel oily as well. Does it contain abovenzone by any chance? Sunscreen is serious for me too! I never leave the house without it. I haven't had a tan since the 80s! That Bioré one sounds great! I don't think it's available here. Why can't we all just get the same stuff haha? The watery line feels quite nice and moisturizing yet light! I think you'd like it a lot. I never knew about PPD ratings before ....good to know! Never tried any of these but I do use different sunscreens for face and body, usually the body gets a cheaper one since I need more of it. PPD thing is scary and frustrating. And it is a disappointment to learn many of the U.S. made sunscreens doesn't meet requirements in countries like Australia for example. 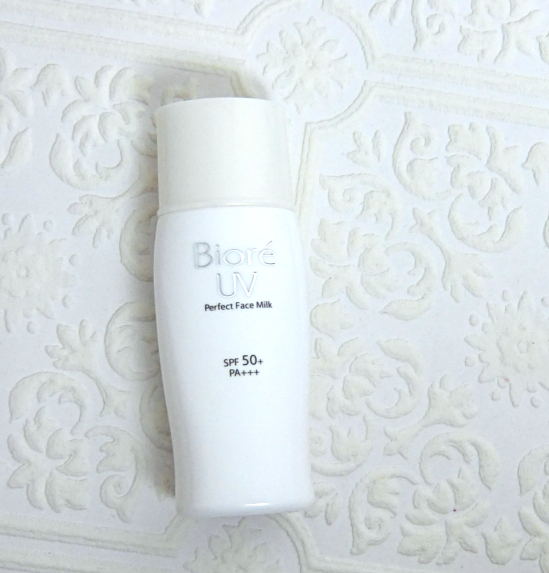 Aw, I used to love the Biore UV Perfect Face Milk but then I realised it was irritating my skin :( Right now I'm using the Sunplay Powdery White for my face and a Nivea one for my body, but I'm still searching for better options. Oh, sorry to hear that. Maybe you are sensitive to alcohol and silicones. It is quite mild for a waterproof sunscreen, though. Have you tried Sofina? That costs a little bit more but is really great. Hada Labo is another great sunscreen maker! I love their toner/essence thingy, too. Shiseido Perfect line and Clarins are great as well. Honestly, there are better options in the Asian countries. Which is why I always bother to order them online. Jealous! i use neutrogena or l'oreal liquid foundation for my face, neck, and decolletage because it's light enough to wear under my makeup without feeling greasy. daily, i use lubriderm lotion with SPF for my exposed arms. been wanting to try the asian biore ones! they always seem so good b/c of the non-greasiness. can't say i've ever tried a gel before. It is harder to find good sunscreens in north America, but Canada has a higher standard and the ingredients like Mexoryl is approved, so you have better options. I too love biore for their light textured and super affordable UV bases! I've used the watery mousse and now I'm on to their whitening cream UV base! Another brand I'm keen on trying from next time is aqua label from shiseido! I am a huge fan of light textures as I'm always in humid weather in singapore but that will be changing in december when I go overseas to study! Isn't Biore really great? I've also used the Watery Cream as well and it is moisturizing and perfect for winter time, too. Us, neither. I order them online usually from the U.S. based sellers. I just learned about PPD recently. Thanks for mentioning it. I've been using Soleil Toujours on my face and Amarte on my body this summer and a UV umbrella at times. I've become one of those ladies ;p I tend to prefer mineral sunscreens because I have concerns about hormone disruptions from some ingredients in chemical sunscreens. 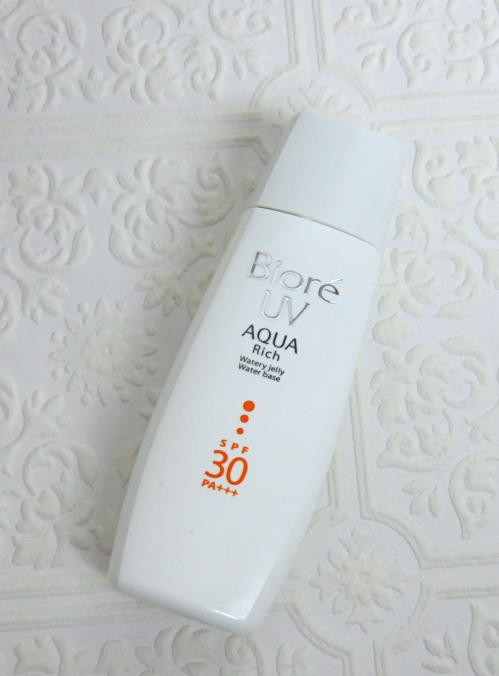 my fave sun screen at the moment is the Biore water essence, it is very lightweight yet provides good protection..the one from paul&joe is also not bad as it also works as primer.. I have a skin type that develops moles and get burn rather than tan, but who gets burn in daily activities anyway? We need more of UVA protection. Asian countries have better options, in my opinion. Great post. I don't know why brands don't talk about PPD more often. You'd think that the ones who have a nice high level would broadcast that everywhere. They prefer to talk about the patented/trademarked ingredients instead, which just sounds like gibberish to the average consumer. So, I might have to shell out for Skinceuticals some day. I've been eyeballing that brand for a couple of years now, but they're pretty expensive. I really like La Roche-Posay and Vichy sunscreens, but the Asian Biore ones are tempting too! Yep, lots of sunscreen over here, too. Still using the Neutrogena for face, and then another all-mineral Neutrogena for body. S and I are going through tubes of it...triple digits and so much sun in the desert! I like the looks of these - thanks for the wonderful post! After experiencing the Clarins all physical sunscreens and reading your review on the Neutrogena, I think I will try more of all physical ones. The one from California Naturel wasn't bad, either. Mmphf. Sunscreen jealousy -- it's so hard to find a good, lightweight sunscreen that's cone-free! Yeah, lightweight & cone-free is rare to come by, I'm afraid. What is your favorite sunscreens, Rae? Amazing post dear.Your blog is so amazing! Sunscreen is definitely a necessity, the best way to prevent premature ageing and wrinkles :P I haven't seen these brands around before, but then again they do look like they are from the Asian market! I've been trying to look for a watery and thin fluid sunscreen here in Australia, but it's been hard! The sunscreen La Roche Posay offers has a white cast which I'm not fond of. Instead I use an Australian brand- Ego Sunsense invisible tint sunscreen which is thick, but provides incredible protection from the harsh sun we have here! I think Australia has excellent lineup of sunscreen. Your regulations are tough! I remember enjoying a brand like Blue Lizard which makes good zinc oxide based sunscreens. If you can find nice ones locally, no need to order online like I have to. I've tried quite a bit here but decided Japanese ones fit best for me. I really like my Shiseido face and body. It is pretty much same as the shiseido regular sunscreen except it is very liquidy so it is easy to apply. My skin seem to like the physicial block better. We dont have those brand. We have Shiseido but not like that. I'll check when i go back to Asia. I'm using Kiehl's and Clarins sunscreens this summer, a like them !